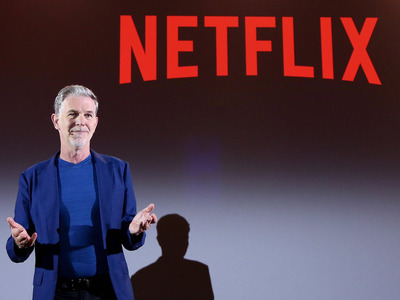 Getty ImagesNetflix CEO Reed Hastings. The Wall Street Journal’s Shalini Ramachandran and Joe Flint spoke to more than 70 current and former Netflix employees for a report on the company’s radically transparent work culture. Some teams at Netflix have dinners or lunches where coworkers take turns giving feedback or criticism to others sitting at the table in “real-time 360” sessions, they reported. Netflix’s 5,400 employees are encouraged to give blunt feedback to one another online, in person – and, on occasion, over dinner. The Wall Street Journal’s Shalini Ramachandran and Joe Flint spoke to more than 70 current and former Netflix employees for a report, published Thursday, on the company’s radically transparent work culture. Not much is kept under wraps at the company. Higher-ups, including directors and executives, can view the salary and pay history of each employee. Workers use a software called “360” for annual reviews – they can review any employee at the company, including CEO Reed Hastings. Some executives choose to share their 360 feedback with their teams. And teams sometimes do a version of these reviews in person. “It can be intense and awkward,” Brandon Welch, a former talent executive, told The Journal. Business Insider’s Nathan McAlone previously reported that those who don’t pass the test are given a severance package and dismissed. The Journal report said Hastings even used it to decide to fire his product chief and friend who had spent 18 years at the company. The Journal said some managers felt pressure to fire people or risked “looking soft” to other executives. Last year, Netflix’s involuntary departure rate was 8% rate, above the 6% US average, The Journal reported. But Netflix said it had an 11% annual turnover rate, lower than the 13% average for tech companies. Netflix disagreed with characterizations of its culture as harsh, noting to The Journal that it ranked second on Comparably’s “Happiest Employees 2018” list.